I couldn’t resist these red suede open-toe pumps I’ll be rocking year- round. Imagine replacing your entire closet and having it refreshed with the season’s hottest new fashion trends. NO THANKS- the mere thought of saying so-long to my collection (through decades) of fall outfits and vintage pieces make my stomach uneasy! Like most brandistas, I’ve spent time, money and my precious energy building style staples to establish my own signature street style, and take on fall looks unique to my personal style. I have a few collector’s items from the ages, inclusive of a favorite- almost shear Morgan State University t-shirt that’s perfectly worn, thinned out and fly as sh$t, I copped as a freshman. Then there are my go-to superpower jeans, inherited from my dad, ok- stolen or borrowed never to be returned. I fell in love and subsequently, acquired them in high school with two simple slits, one on each knee. If you knew me in high-school you also knew them, the stories they hold are as intense as the holes they bear. Decades later, two bouts of alterations, and years of shared experiences, she’s my all-time favorite piece of clothing: morphed into the perfect pair of comfy, oh-so-chic sentimental treasure beyond replaceable. Instead of starting from scratch, season after season, I swap out Netflix to binge-watch new fashion trends command the runways of major fashion houses from New York to Milan- to seamlessly transition into a functional street style and our closets. At this point in life, I wouldn’t have it any other way. Clothes hold stories and memories, and while I purge my closet twice a year, there are fashion pieces I’ll grow old with. Through experiences, I’ve connected with them in ways people probably shouldn’t relate with things. It’s what it is, so here’s how you can fresh your fall outfits with simple pieces. On top of getting your arm candy and basic essentials (think tanks, bodysuits, and t-shirts) in gear, adding a few style staples as needed; identify a few signature fall clothing colors as your go-to hue for the season. Opt for vibrant, popular (because you’ll have more options) colors that inspire you to want to paint the town red. Speaking of red, I went with it. My favorite color + an “it” hue of the season. Red has a way of bringing out the best in me. For today’s look (my ootd), I’d been eyeing these peep-toe suede candy apple red Christian Louboutin booties (click for a similar style I’m eyeing) for some time and I’m happy I snagged them when I did because they quickly sold out. A swipe of red enlivens my face, so as a complement to the booties, I scooped Mac’s red lip kit, a trio of lip products that gives me a vibrant classic red in multiple ways. I’ve been outlining my lips, adding the lipstick and finishing the look with a top coat of liquid color. Once I’m tired of the full-on glam look, I’ll go for the lipstick and liquid color separately. Every girl needs a duster (click for a similar style) or a full trench coat to throw over the basics to rock out her best street style. This little number is an oldie but goodie, but they’re amazing versions all over from specialty boutiques to department stores. Try a few different versions. I prefer dusters that are tailored throughout the shoulders and flow through the bodice- but with a few try on’s you’ll feel which cut is right for your personal style. Nothing says A statement bag with a big personality can do wonders for a wardrobe refresh your fall outfit like the addition of a fabulous statement bag. I planned today’s look around the oversized-wristlet. I was intentional in choosing red booties to pick up the red in the web of my Gucci CG Supreme bag. 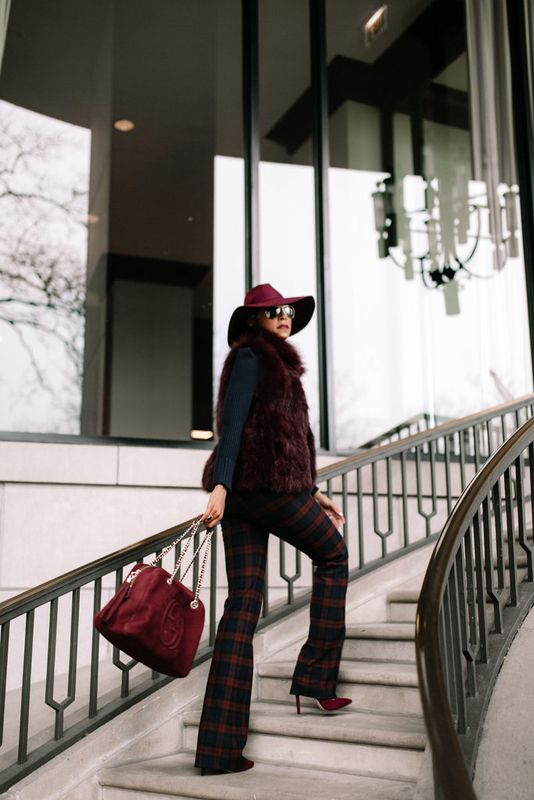 Just like that, by adding a few style staples, I’ve refreshed my fall looks by weaving in a few trendier items from the season. While they’re trends of today, trust I’ll have no problem pulling them out and confidently rocking them for seasons to come. They are Christian Louboutin’s Pijonina 100 Veau Velours in Rougissime. Snag your monthly fix of style, beauty, and lifestyle love dripped in a swag + sprinkled with love delivered right to your inbox. TheBGuide by Courtney Rhodes @aka The Brandista Copyright 2018. Madrid Theme by MunichParis Studio.